Evidence suggests that surgical performance is impaired by stress although there is little to directly quantify its effects on surgeons’ technical ability. Moreover, surgeons’ individual differences in managing stress have not been examined. The present study aims to establish a direct empirical link between stress and surgical performance and explore the relationship between trait Emotional Intelligence (a personality characteristic known to affect how people manage emotions) and stress in surgeons. 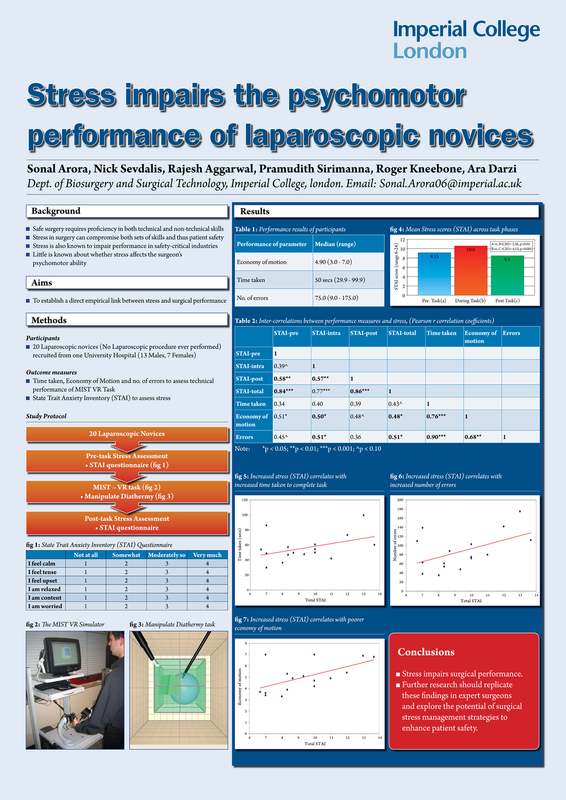 Twenty laparoscopic novices participated in the study. Participants carried out a laparoscopic task on a MIST-VR simulator. Validated dexterity parameters were obtained from MIST-VR (path length, time taken, number of errors). Stress was assessed pre-, intra-, and postoperatively using the validated Stait Trait Anxiety Inventory (STAI). Participants also completed the Trait Emotional Intelligence Questionnaire – short form (TEIQueSF). Data was submitted to correlational analyses. Technical performance was assessed for all subjects (n=20) regarding time taken (median= 50+/-18 secs), economy of motion (4.90+/-1.37) and number of errors (75.0+/-43.32). Stress levels peaked intra-operatively (M = 10.60+/-2.23) compared to pre-operatively (M = 9.15 +/- 2.89; t(19)=2.26, p < 0.05), and post-operatively (M = 8.60 +/- 2.24; t(19) = 4.53, p < 0.001). Significant correlations were obtained between the three dexterity parameters (rs 0.68-0.90) and between stress levels across procedure stages (rs 0.57-0.58). Stress correlated positively with economy of motion (r=0.48) and number of errors (0.51), indicating that higher stress levels were associated with worse performance. EI correlated with stress (r=0.14), but weakly. This is the first study to demonstrate direct impairment of surgical performance associated with stress. Higher EI was associated with higher stress levels, but the link was not clear. Further research should replicate these findings in expert surgeons and explore the role of EI in surgical stress management.